It was a moonlight night. Very wisely I began to use an app. called Photographer’s Tools that indicated me the setting time for the moon, so the picture was taken 15 min before it sinking behind the hill. 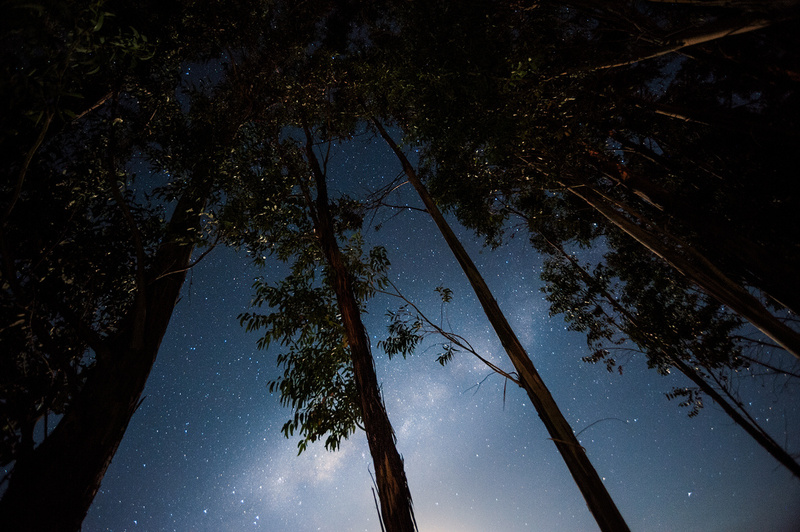 If the moon had been at the zenith no way it could have illuminated sideways the eucalyptus stems; I am still experimenting but I have heard of the golden hour of the moon happening at its setting time. Following the rule of 500 I chose the exposure length of 20 seconds to get a sharp milky way. I was tempted to lightpaint the trees but in the end prevailed the use of the plain available natural light. A special difficulty was to focus on a very dark subject as the trees were. My first attempts were unsuccessful, I was using an AF zoom very sensitive as to adjust it by hand. My recommendation would be to get the most powerful flashlight to aim it at the target. If the target is beyond 10 meters it will come in focus easily if aligned to infinity, but attention must be paid to closer subjects. Also some practice with the gear before hand will make things easier in the darkness, as well a refreshment about the basics of hyperfocal distance. LR and PS.